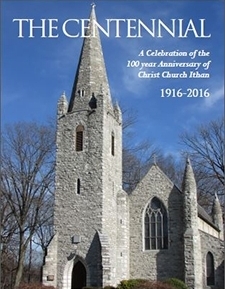 Our little stone church on the Conestoga Road, one of the first highways of the American colonial era, is commemorating the one-hundredth anniversary of the placement of the cornerstone in 1916 and of its consecration three years later in 1919. This beautifully simple Gothic church is a gift to God and his people by a gifted architect who designed and built the "stone chapel" on his own land with his own funds. One hundred years later it stands as a spiritual sanctuary by the side of the Conestoga Road just exactly as it was when Theophilus Parsons Chandler had completed his creation. In 1916, one of several large parcels of land in the Ithan area was the "Ithan Farm" that was owned by Theophilus Chandler and his wife Sophie Madeline DuPont Chandler. It was upon this land that extended from Newtown Road to Conestoga Road that this preeminent Philadelphia architect of his time decided to design and build a simple gothic style, country church. This plan was first proposed to the Diocese on November 8, 1916 when Mr Chandler met with the secretary of the Commission of Church Buildings to discuss his plan for a chapel that would be donated to St. Martin's Parish. The Diocese official noted: "The work is so advanced that he (Mr Chandler) tells me he has asked that you will arrange for the laying of the cornerstone," which took place the next month.